I devoured this book. I couldn’t stop reading. I started this book being #TeamWeston. I wanted Ella to choose him, in turn walking away from her marriage. That makes me sound like a cold, heartless b!tch, but I just never understood why Gabe let this all go down in the first place when they seemed so happy. I am glad to say we get the answer to that question! I understood why Weston wanted this initial arrangement; I know what he was hoping to accomplish. At about 15% into the book, my heart was breaking for Gabe, and I became a member of #TeamTorn. I felt like I was reading Twilight all over again. I was completely heartbroken. I knew I wanted the characters to be happy, but I didn’t see how that was possible. 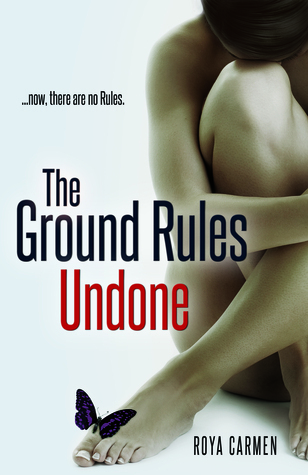 I wouldn’t want to be Ella in The Ground Rule Undone. She is keeping a huge secret, one that will impact everyone’s life that is involved. My heart was breaking just watching her struggle, trying to do the right thing, trying not to hurt the man she loves and her family. To watch someone struggle is the hardest thing for me especially when they are attempting to make things right. I will admit she did make mistakes, but her intentions were good. When the truth finally comes out, her life is flipped upside down; she is left with only her best friend to turn to. Ella’s strength and commitment to righting her wrongs is empowering. What do you do when you learn that the woman you love has broken all the rules? What do you do when you find out the woman you love has been keeping something from you? Do you break all the rules again or do you start to follow them. I’m not sure who had the shorter stick in this book. My heart was breaking for both Gabe and Weston. I wanted Weston to have the happy family he’d created in the doll house. It was perfect; a mom, dad, two little girls and a baby. I wanted Gabe to get his wife back, his family. I just wanted everyone to be happy. It just isn’t possible to make two happy families out of three people. I knew someone was going to lose this battle for Ella’s heart. I was sure that my heart was going to break right along with his. When tragedy strikes the men in Ella’s life step in to help her deal with the situation despite all the pain and heartache it causes. However, there comes a time when you must say goodbye to the one you love. Whether that’s because your time as a couple has expired or because your life is over or maybe your memories of your time with that person are different. Perhaps you realize that you are no longer in love with them, or maybe your love is just different now. Lives are uprooted, dreams are crushed, promises are broken, and loves are lost and found. The story was an emotional roller coaster of a book. I can honestly say I will miss these characters for a long time.